Biochar is produced by heating biomass in the total or partial absence of oxygen. 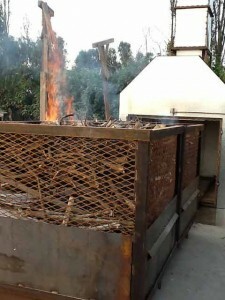 Pyrolysis is the most common technology employed to produce biochar, and also occurs in the early stages of the combustion and gasification processes. 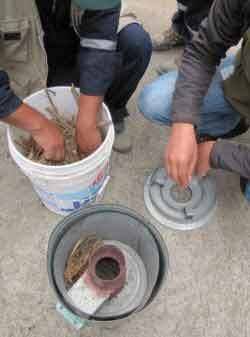 Besides biochar, bio-oil and gas can be collected from modern pyrolysers. These could be refined to a range of chemicals and/or used as sources of renewable energy if derived from sustainably produced biomass. The pyrolysis gas is mainly a mixture of carbon monoxide (CO) and hydrogen (H2) with lower quantities of CO2, CH4, H2O, and a range of volatile compounds. Pyrolysis gas is costly to store and transport and therefore, it is usually combusted on-site to meet the heat requirements of the pyrolyser. 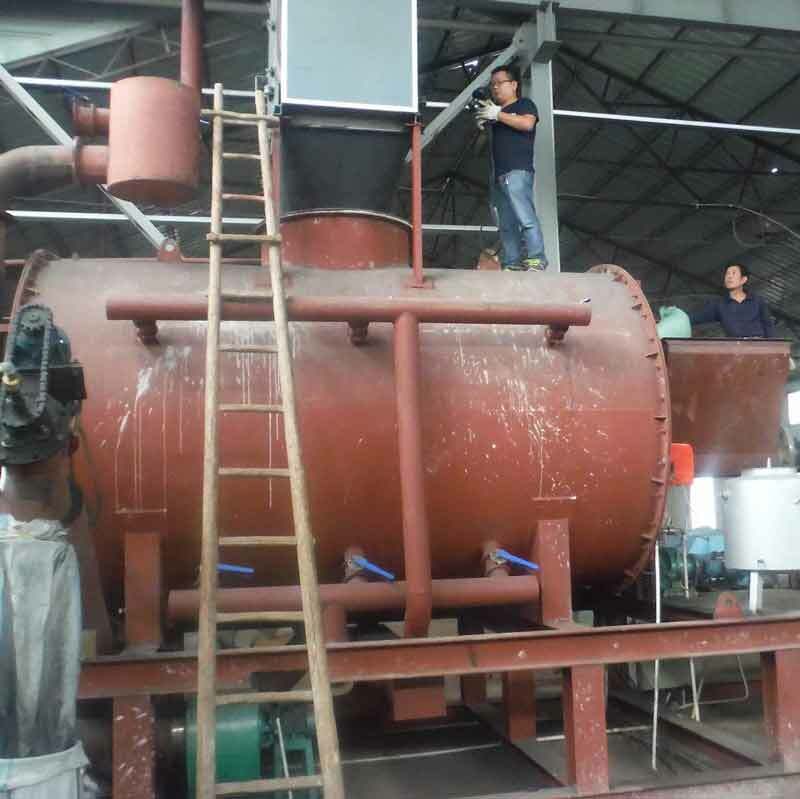 However, if the heat energy released during combustion of the pyrolysis gas exceeds the demand of a biochar system and opportunities exist nearby the plant, then the pyrolysis gas could be used to provide heat for external processes. 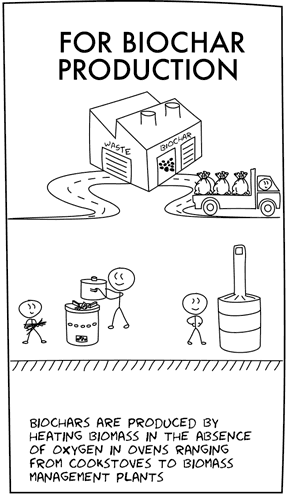 If the energy provided by the pyrolysis gas is converted into electricity, then this can be fed into the grid. Bio-oil consists of a complex mixture of oxygenated hydrocarbons with a considerable fraction of water. Bio-oil is attractive for the energy industry due to the fact that it is transportable, storable, and a potential replacement of fuel oil or diesel in stationary applications including boilers, furnaces, engines, and turbines for electricity generation. However, it cannot be used directly as a transport fuel unless it is upgraded, which is technically feasible but expensive. In addition, bio-oil can be a source of a number of valuable chemical products such as acetic acid, resins, sugars, food flavourings, slow release fertilisers, adhesives and preservatives. Charcoal has been produced from woody biomass for thousands of years. In developing countries, traditional earth-mound, brick, and metal kilns are inefficient in producing charcoal and usually do not include burning of the exhaust gases. Therefore, they are regarded as an important source of deforestation and greenhouse gas emissions. Moreover, small-scale pyrolysis stoves are promoted to decrease fuel consumption and deforestation in developing countries, improve respiratory health, and increase soil fertility by incorporating the biochar into soils. Two toxic compounds, polyaromatic hydrocarbons (PAHs) and dioxins can be also present in chars and bio-oils produced during pyrolysis. Large quantities of PAHs are formed in chemical reactions at temperatures over 700oC and evidence suggests that small amounts of PAHs can also be formed in pyrolysis reactors operating between 350 and 600oC. Dioxins predominantly form at temperatures above 1,000oC and are significantly reduced when chlorine and metals are not present. It is important to note that in any modern biochar manufacturing process these toxins must be avoided. To ensure that biochar production does not contribute to air pollution and GHG emissions, biochar must be produced in a facility that captures and combusts the gases released when biomass is heated. The heat produced through combustion of these gases can be used as a form of renewable energy. Biochar production can occur at scales ranging from a cook stove to large engineered industrial-scale plants. Slow pyrolysis could be used in intensive animal production or landfill systems as a waste management solution, delivering renewable energy and converting end-of-life biomass to valuable stable carbon-based soil amendments that facilitate nutrient recycling. Several physical properties have been identified to measure the quality of biochar: pH, volatile compound content, water holding capacity, ash content, bulk density, pore volume, and specific surface area. The IBI (2015) has formalised these and other properties into a proposed reporting standard. The characteristics of feedstock and production parameters determine the physico-chemical properties and nutrient content of biochar. 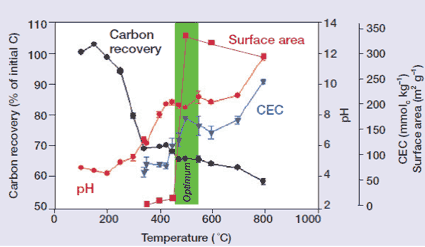 Based on surface area, pH, and cation exchange capacity (CEC), Lehmann (2007) proposed a temperature between 450-550oC to optimise the characteristics of biochar for use as soil amendment (Figure 1). Figure 1. Temperature effects on carbon recovery, cation exchange capacity (CEC; measured at pH 7), pH, and surface area for dried wood from Robinia pseudacacia L. (Lehmann, 2007). effects (e.g. on water holding capacity, pH, CEC, turnover rate, soil temperature, microbial activity, plant growth, nutrient leaching, toxins immobilisation, GHG emissions, albedo).